Home » Posts » Blogs » Are Cataract Implants a Good Option for You? Are Cataract Implants a Good Option for You? Cataract surgery is one of the most rewarding procedures we perform, with hundreds of successful operations each year. As one of the UK’s leading private cataract clinics, we gain great pleasure in restoring vision that makes a real difference to patients quality of life. The surgical process itself is relatively short, usually taking around 30 minutes per eye, and has a great safety record with an excellent patient satisfaction rate. Indeed, the World Health Organisation ranks it among the safest surgical procedures. One of the main questions we receive about cataract surgery focus on the cataract implants themselves – what are they and what choices do I have? Many people also want to know what the differences in treatment are between the NHS and private sector. Hopefully, by the time you finish reading this article, you will be much better informed about your complete cataract lens options. Cataracts are an age-related disease, affecting 50% of people over the age of 65. They are clumps of protein that grow on the natural lens of the eye, obscuring light, and causing a catalogue of vision problems as time progresses. The progressive nature of cataracts mean that the natural lens becomes damaged, and in order to regain full sight, they must be removed. Cataract implants replace the natural lens, restoring sight and allowing clear vision without any risk of cataracts re-occurring. The bio-compatible materials used in the lens mean that the body readily accepts them without issue. 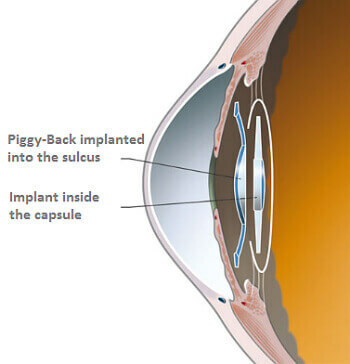 Monofocal – these implants correct only distance vision. You will still need to wear reading or varifocal glasses. Multifocal – suitable for the correction of distance and reading vision problems. Trifocal – these lenses can rectify distance, intermediate, and reading problems. They will enable you to be glasses-free. We specialise in trifocal implants and now use trifocal intraocular lenses, more commonly known as trifocal IOL’s. These offer unrivalled vision quality and patient satisfaction rates. If you have already had monofocal lens implants on the NHS, you also have another option called piggyback trifocal lenses. Just like the name suggests, these lenses ‘piggyback’ on the original monofocal implant and allow for complete vision correction for distance and reading. It is important to note that being free of glasses depends on the lens you choose. By opting for the monofocal implant, you will still need to wear glasses of some prescription. This is a major disadvantage to having surgery on the NHS. Will the implant feel natural? All implants have been designed with the patient in mind. Unlike some contact lenses, there are no sensitivity problems. Only the latest lenses from trusted manufacturers are used. It is important to note that none of the cataract implant lenses will cause any discomfort issues. The lens implants are generally made from acrylic or silicone – both bio-compatible materials with excellent long-term safety data. Nowadays, they are also treated with a UV resistant layer, to protect your eyes from sun damage. Expect your lenses to last forever. Once the procedure is performed, you will have clear vision for the rest of your life! Check out our excellent reviews for further proof! What experience does AVC have? At AVC, we have been at the forefront of cataract surgery for a long time; our Alcon operating theatre is the most advanced in the UK. Another benefit is that we can perform the full treatment process in our quality Harley Street clinic. This starts with your consultation, and ends when you are satisfied! Aftercare begins the day after surgery and usually lasts for up to one year. To ensure a continuity of care, our vast optometrist network will ensure any issues can be followed up at a location closer to your home. This avoids the need to travel, while still giving access to our excellent medical team. Do you now have a clearer idea of your cataract implant options? Are you ready for a clear-sighted future? Get in touch with us today. We can correct any prescription, and our trifocal lenses will leave you without the need for glasses. In addition, our relationships with a number of private health insurance companies could mean that financial assistance is possible. If you are interested finding out more about cataract implants, then why not call AVC TODAY on 0800 652 4878 and request your free information pack or book your consultation to find out how we can help you.